If you're looking for the best Nintendo Switch game deals on the net this week, we've got you covered. To say the Nintendo Switch is a return to form for the oldest name in games is a huge understatement, so let's get you hooked up with some software! Sold out for months on its original release, console stock is much more readily available now and has been steadily selling well after an excellent shopping season around Christmas. The sales of the console have already surpassed the ill-fated Wii U, but Nintendo has rather cannily looked at the older console titles to fatten up the Nintendo Switch catalogue. Remasters can often feel like a cynical cash-in, but given so many people didn't bother buying a Wii U, we think this is a great opportunity to catch up on some classics that were almost lost. So we're not really surprised to see some of these remasters dominating the charts on the Switch. But with E3 being just around the corner, we're optimistic about some brand new titles being announced. Until then, these are the best Nintendo Switch game prices you can pick up today. We love colourful platformers here at T3 and the PS4 and Xbox One just aren't giving us what we want nowadays (Ratchet & Clank have eased our pain though). Nintendo's reliably family-focused catalogue means there's always something for hop-happy gamers to enjoy too. This remaster of the Wii U version gives the game a second life and an audience already bigger than it could ever have had on the older console given the Switch's huge early success. Naturally, it's prettier, given its upgrade to 1080p from 720p and also enjoys a super slick frame-rate. 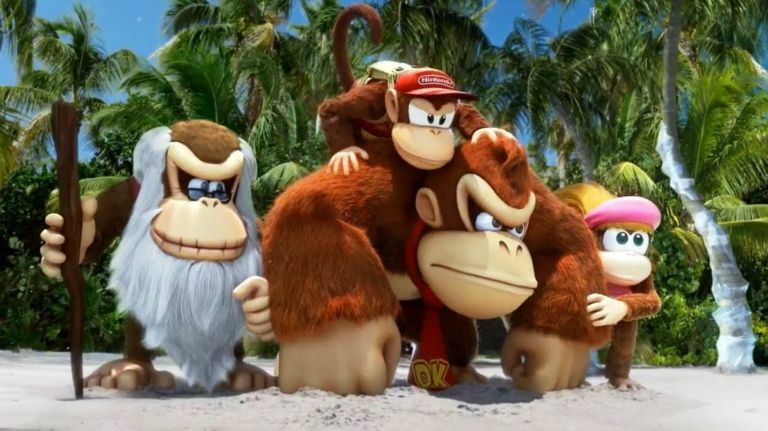 You can also choose a new optional character called Funky Kong who glides around on his surfboard, has more health and can breath underwater - yep he's basically an easy mode for anyone struggling with the default difficulty. We won't judge you. We will. Another re-release of a Wii U game here, but given the excellent multiplayer capabilities of the Nintendo Switch, Mario Kart 8 Deluxe is an essential purchase for all players. In addition to a new layer of graphical loveliness lavished on this ace racing title, you're also getting all of the original game's DLC thrown in too. It's admittedly quite expensive for a remaster, but Nintendo loathes discounting its first-party exclusives. You never know, we might see Mario Kart 9 announced at this year's E3. Until then, we're going to keep practising Rainbow Road at home so we don't have any more 'incidents' on the bus. Speaking of Nintendo exclusives that don't come cheap! Super Mario Odyssey is another classic for the plucky plumber and continues to be a fixture on the chart's podium. If you're after a beautiful open world platformer with colour and charm in spades, you won't do better any time soon than Mario's latest outing. Find out why the game has an astonishing 97 Metacritic rating by taking advantage of the cheapest prices below. At least you're getting excellent value for money. Just in-case you did buy a Wii U and had your fill of Donkey Kong and Mario Kart first time around, maybe you're looking for something genuinely new from Nintendo? Well, Nintendo Labo is just that. USA deal: Picking up a decent carry case in a Nintendo Switch bundle is always a smart idea. Other current bundles in the US don't actually seem to discount the games they come with (booo! ), but you're saving a few bucks on the cost of the case and display stand included with this bundle.